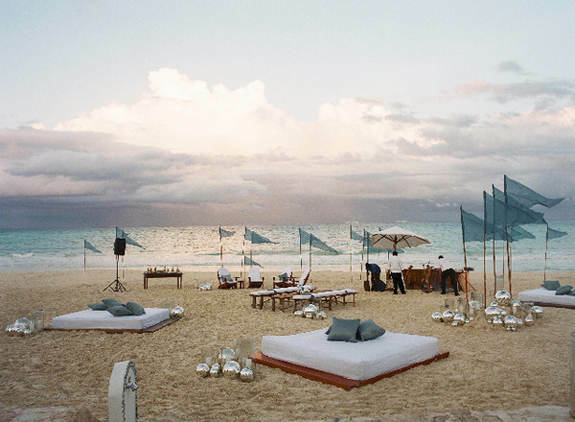 When it comes to beach wedding decorations, you have to think outside the box a little. Don't just think "wedding". Think "summer", "holiday", "romance" and "laid-back". If you combine all these elements and you let your imagination go a little, I am sure you can make your beach wedding ceremony and/or reception decorations something your guests will be talking about for a long time to come. So, of course the decor you are brainstorming about here will depend of whether it will be for your ceremony or your reception. 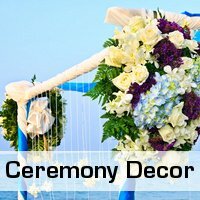 Maybe you are having only your ceremony on the beach or you are looking specifically for beach wedding decorations for your ceremony. For ideas on reception decor read further below. 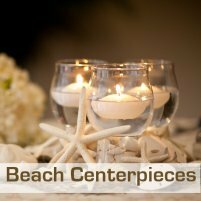 Your beach wedding centerpieces are of course also part of your decorations, and should compliment the rest of the decor you want to use for your reception. Discussing centerpieces here will just be much too big a page. Click Here for some inspiration for your centerpieces. 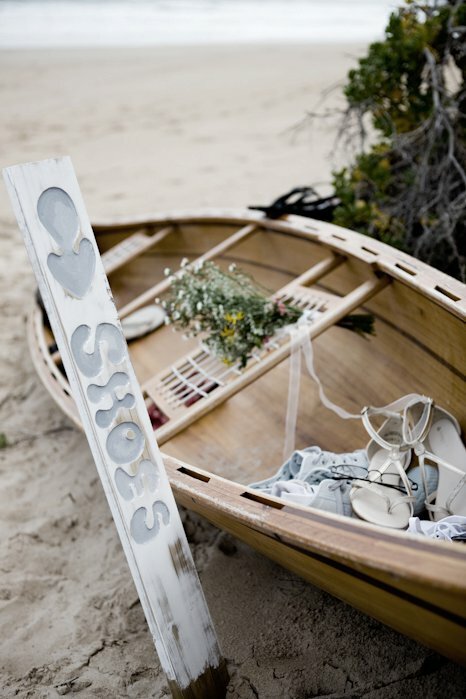 It might be much easier to find the perfect beach wedding decor items if you had a designated theme. Yes, I hear you, beach wedding is a theme, but you can be more specific than that. Think island, surf, beach party, nautical, under the sea, mermaid fantasy. The list goes on and on. 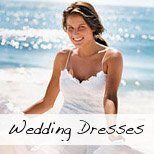 There are many exciting beach wedding themes and decoration ideas on this site complete with ideas for the decorations. 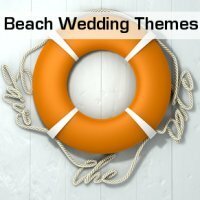 Follow this link to view a few Beach Wedding Themes. If the whole "theme" thing is not your scene, then perhaps just a color scheme is all you need to help you choose your beach wedding decorations. Beach wedding colors can range from the turquoise seas of the tropics to the deep navy blue of the Atlantic. 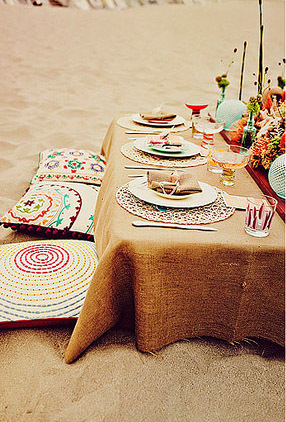 Of you could base your beach wedding colors on the color of the sand and shells. 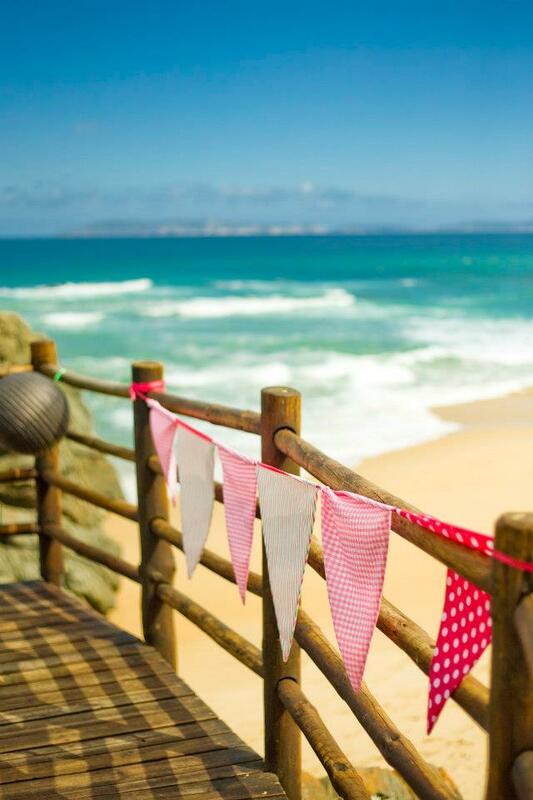 Another great and more informal beach wedding color scheme is to have a bright beach wedding, reminiscent of colorful beach towels, beach balls and bathing costumes. Or think tropical colors or shades of coral. The choice is all yours. So, you have decided on a theme or a color scheme and you are still looking for some ideas for your reception beach wedding decorations. Your Time - how much DIY are you wanting or willing to do (or get others to do for you). Ok, so you have an idea of your budget, the guest list, the venue and you know how much of it you want to do yourself. Now let's brainstorm. You guys are all about family, friends, food and having a great time together celebrating your love. You love the sea, the beach, the outdoors and perhaps one of you is a surfer or other water sports enthusiast. The thought of lugging heavy chairs and tables to the beach is just not what you have in mind when you think about your wedding reception decor. 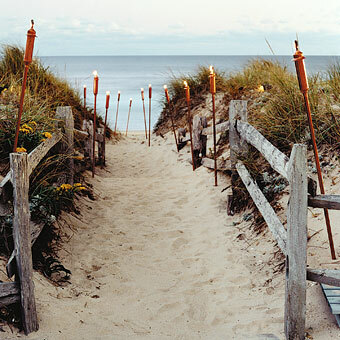 Tiki torches are great beach wedding decor items. They themselves are decorative, but other decor items like shells and flowers can also be attached to them. 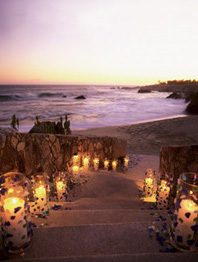 Use them to light pathways and/or group them in three and place them all around for an intimate feel. 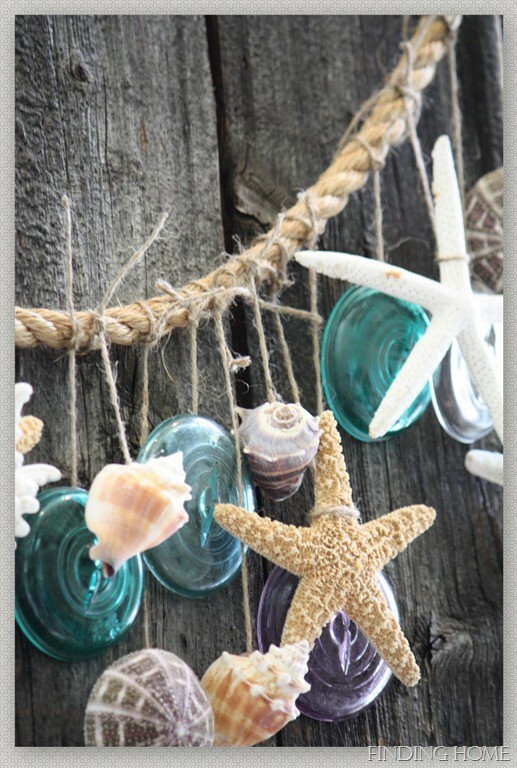 An easy to make garland of glass, shells and starfish that can be hung from the main table, the buffet table or anywhere you think needs some color. 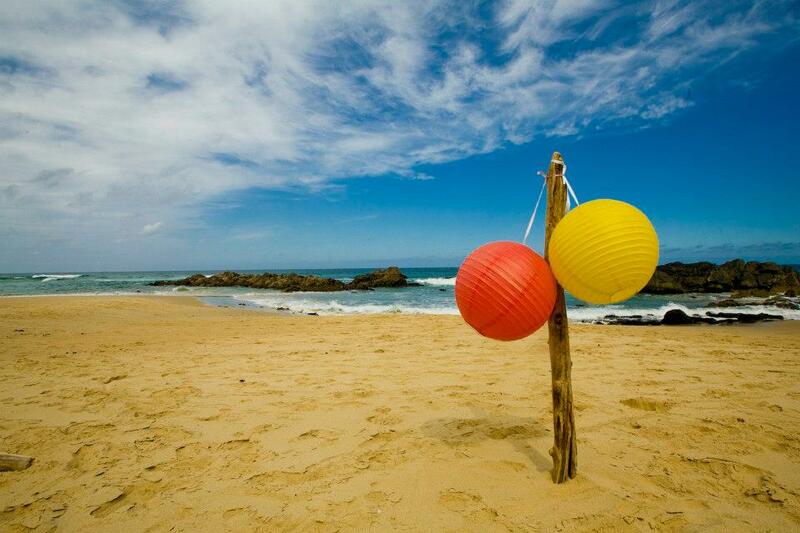 Paper lanterns make great beach wedding decor items, are inexpensive and easy to transport as they fold flat. Use plain white ones or multi colored and hang them from any type of canopy or tent, string them between poles or simply hang tow on a pole planted in the sand like the photo above. 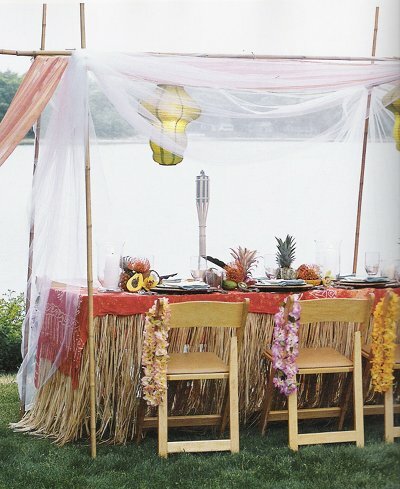 To make your picnic-style beach wedding out in the open feel a little more intimate, create little tented spaces with three bamboo pieces and some fabric. Hang a lantern or small chandelier in the middle. So sweet! Not only are old row boats great decor items, they are also functional and can be used as a shoe check or filled with ice and drinks for an informal bar. A simple canopy over low reed tables make this such a chilled scene for a daytime reception. 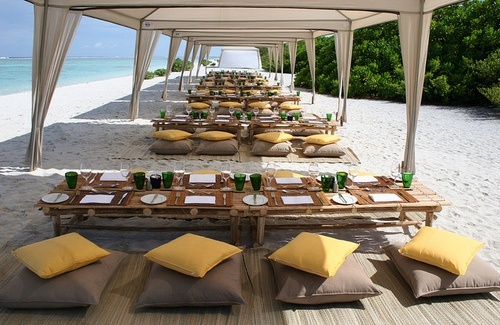 Place reed mats on the sand with soft cushions on top of them to minimize the amount of sand that might get kicked onto the tables. Bunting, banners and garlands are really hot right now amongst DIY brides everywhere. They also make great additions to beach wedding decorations. Here is a great tutorial. 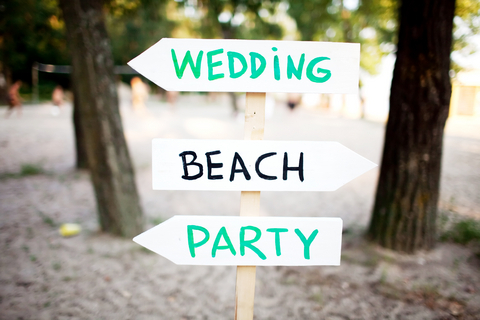 Signage for your beach wedding can help guests find their way around, but they are also decorative and can include things like quotes and lyrics. 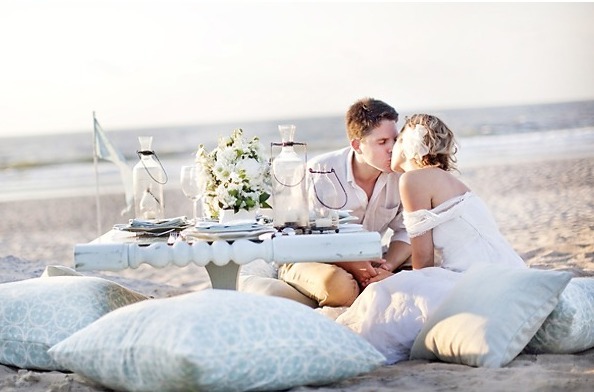 Grass mats, low tables and cushions make this beach wedding reception feel cozy and relaxed. Chill areas of mattresses make this this wedding look relaxed while triangular fabric flags add a height dimension and make the best of the breeze. Burlap is really popular right now and is great for informal beach weddings as it lends a slightly rustic, bohemian feel to the decorations. Use as table cloths, chair back decor or draping for canopies. You are an incurable romantic and you have dreamed of your wedding day for as long as you can remember. You love romantic pastel colors, lace and anything vintage. 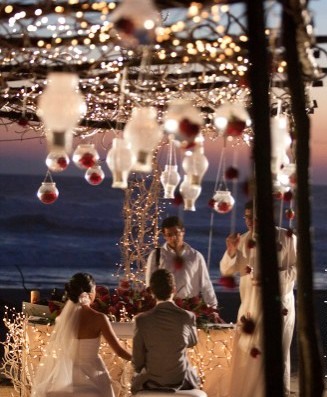 You want your beach wedding decorations to compliment this important step you have taken in your life and you want it to reflect the love you two feel for each other. Soft lighting is your best friend when you want to create a romantic atmosphere. Above, a wire was strung between two poles and different chandeliers were hung on it, lit with fairy lights. Using low tables (keep them on the smaller side for a more intimate feel) and big, comfortable cushions make this an utterly romantic scene. 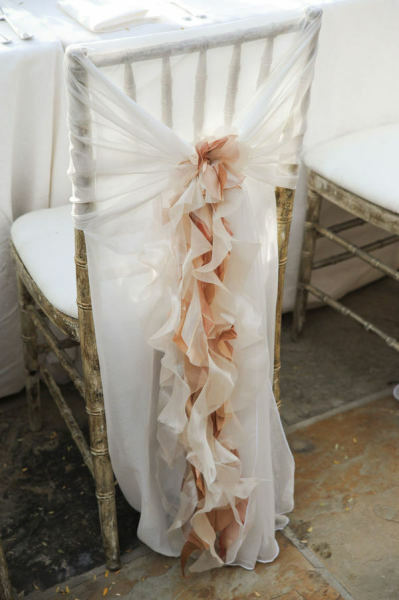 This chair back cover is perfect for a beach wedding as it is just so romantic and floaty. 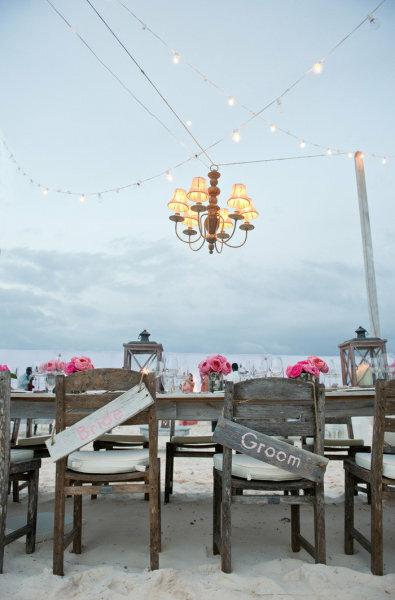 Great if you want to go the chairs and tables way with your beach wedding decorations. A garland of starfish or other shells would be great as a backdrop to a dessert table or anywhere else for that matter - just perfect for beach wedding decorations. 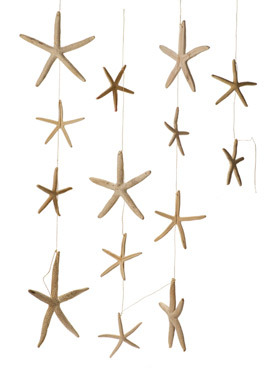 You can use real starfish or sea urchins, or make your own salt clay starfish. Drape a gauzy, see-through fabric on a makeshift canopy to create an intimate feel for your wedding table. The raffia table skirting can be easily ordered online. 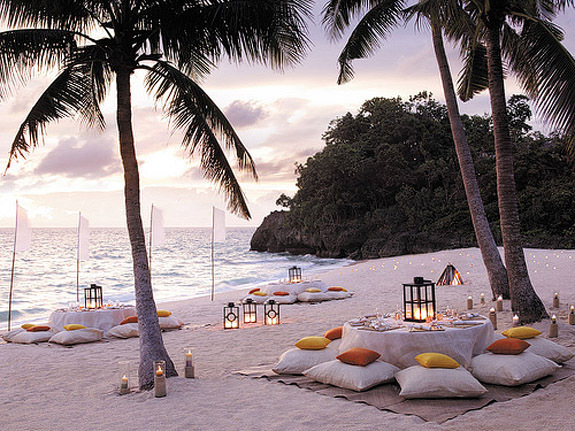 With a beach wedding, sometimes keeping things simple is the best. 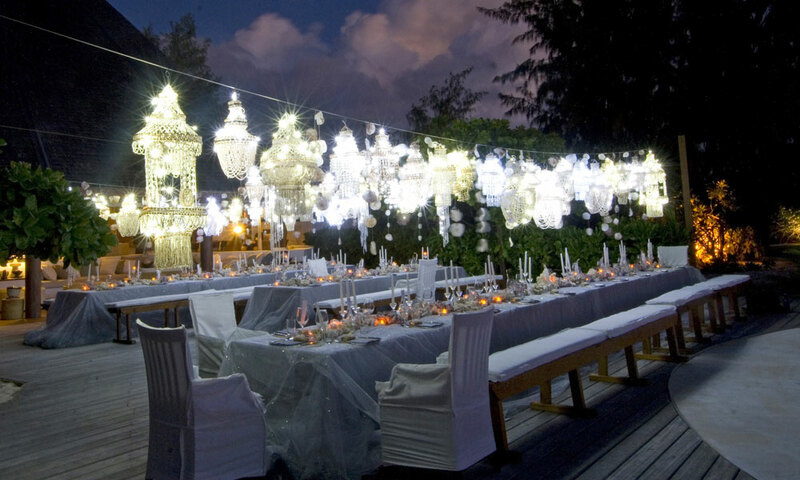 This photo proves that you can use a simple string of lights and a single chandelier to maximum effect. If you have any kind of canopy or structure, hanging fairy lights, glass votive holders with flowers and candles can really make for a wonderfully romantic atmosphere. 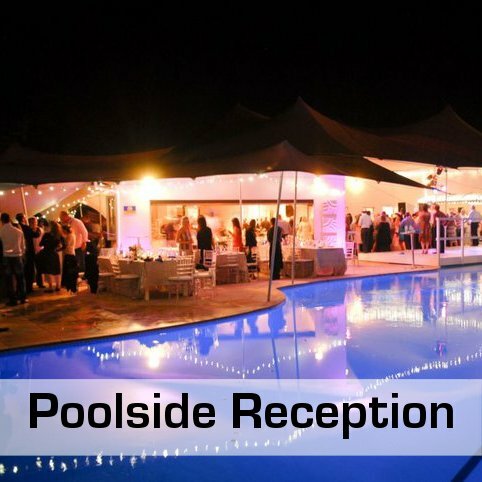 If you choose not to, or cannot have your wedding right on the beach with your toes in the sand, then a poolside reception would be the next best thing in my opinion. You also have the option to be a little more formal with this one while still bringing in some beach wedding decorations for a touch of the seaside. Click here to get some great inspiration for this look. 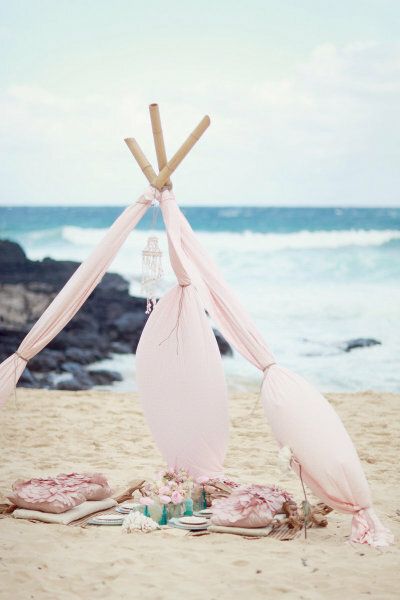 More Beach Wedding Decor Ideas? 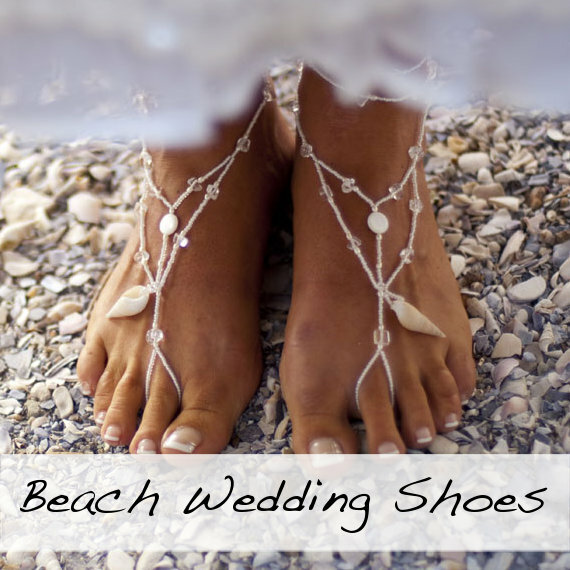 If you are looking for some more ideas for beach wedding decor, click here.